The Friends represents people with a wide range of interests in the Necropolis, from family members who are buried there to the plants, animals and birds that live there now. 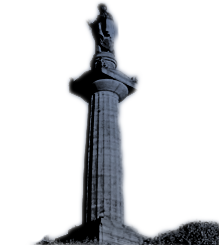 If you have an interest in the history of Glasgow, or in learning how our ancestors lived and what they believed about death and the hereafter, or in any of the aspects of the Necropolis, you should consider joining. Your membership will help to ensure that this great cultural treasure will be conserved and developed into an attraction for locals and visitors that helps to explain this city’s history and character. Everyone who joins the Friends will be helping to restore a sense of pride in the Glasgow Necropolis. Your membership will help to ensure that the city’s great cultural treasure is not allowed to deteriorate any further. Join us now – just select your membership from the choices below. If you would like a Single life-time membership, then click "Buy Now" below to continue to checkout. If you would like a Joint life-time membership, then click "Buy Now" below to continue to checkout. If you just want to give a donation please go to our donate page.